Round Rug Is Perfect For Teaching Letter And Number-Recognition, Color Recognition, Phonics Rules And More. 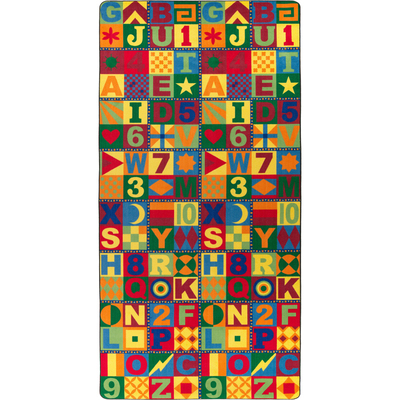 Brightly Colored Design Showcases All 26 Letters Of The Alphabet, Numbers From 1 To 10 And Various Shapes To Help Students Build Early Skills. High-Quality Print Is Manufactured At 625 Dpi For Crisp, Detailed Images With Excellent Definition And Clarity. Highly Durable Construction Is Bound And Double-Stitched With Nylon Edge Yarn For Reliable Strength And Sturdiness. Antimicrobial Treatment Helps You Maintain A Germ-Free Environment By Guarding Against Odor, Mildew And Mold. Scotchgard Protector Resists Heavy Soils To Quickly Clean The Rug In The Event Of An Accident.. Round Rug Is Perfect For Teaching Letter And Number-Recognition, Color Recognition, Phonics Rules And More. Brightly Colored Design Showcases All 26 Letters Of The Alphabet, Numbers From 1 To 10 And Various Shapes To Help Students Build Early Skills. High-Quality Print Is Manufactured At 625 Dpi For Crisp, Detailed Images With Excellent Definition And Clarity. Highly Durable Construction Is Bound And Double-Stitched With Nylon Edge Yarn For Reliable Strength And Sturdiness. Antimicrobial Treatment Helps You Maintain A Germ-Free Environment By Guarding Against Odor, Mildew And Mold. Scotchgard Protector Resists Heavy Soils To Quickly Clean The Rug In The Event Of An Accident.